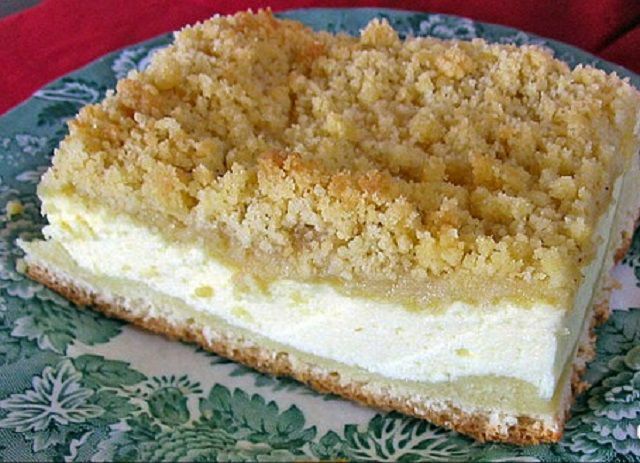 This German Coffee Cake with Quark and Streusel, or Streuselkuchen mit Quarkfüuellung in German, is one of my favorite, easy sheet cake recipes. The yeast-dough base features a creamy, cheese filling and a crunchy-sweet streusel topping. It goes together in three parts but each part is uncomplicated, with few ingredients. Makes 1 (13x9-inch) pan, about 12 servings, of German Cheese-Streusel Coffee Cake. Place 2 cups flour in a large bowl and create a hollow in it with the back of a spoon. Crumble fresh yeast or sprinkle dry yeast in the hollow, fill with the lukewarm milk, add a pinch of sugar and mix a little to incorporate some of the flour. Let the sponge sit in a warm place for 15 minutes. After the yeast is activated and showing strong growth, add 2 tablespoons butter, 2 tablespoons sugar and 1/4 teaspoon salt to the milk and mix the dough, pulling in the flour as you go. You may also use a stand mixer for this step. Continue mixing until the dough is smooth and forms a ball. Add a little more flour if necessary. Form dough into a ball, place in a greased bowl, turning once, and cover. Let rise 15 to 30 minutes. Roll out on a lightly floured board to a 13x9-inch rectangle and transfer to a 13x9-inch baking pan that has been lightly coated with cooking spray. Press towards the edges gently, creating a lip (like a pizza crust). Let this dough rest while you mix the filling and topping. In a medium bowl, cream together 5 tablespoons butter, lemon zest, and 6 tablespoons sugar for 2 minutes. Add 1 egg and beat until light and fluffy, scraping down the bowl as you go. Add the quark or yogurt cheese, mixing until smooth. Sprinkle the cornstarch on top and mix to incorporate. Smooth the filling over the yeast dough. Heat the oven to 350 degrees F.
In a small bowl, mix together 1 1/2 cups flour, 2/3 cup sugar, 1/4 teaspoon salt and cinnamon. Using your hands or a pastry mixer, cut 7 tablespoons butter into the flour mix until you have coarse crumbs. Sprinkle these crumbs on top of the quark filling. Bake the cake for 30 minutes, or until cake is lightly browned and filling is almost set. The filling will set up more as it cools. This cake freezes well. After defrosting, crisp it up for a few minutes by placing it in a 350-degree F. oven. Make this cake the modern way. Use instant dried yeast and add all dough ingredients to a bowl and mix together to form a smooth dough. No need to proof the yeast. Allow 30 minutes to rest, then proceed as above.